Rep. Pete Aguilar's office, with the transgender pride flag on the right. 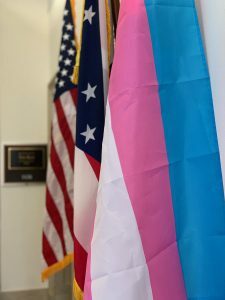 The changes came at the urging of the National Center for Transgender Equality, which is delivering flags to congressional offices in advance of International Transgender Day of Visibility. Among the members to make the switch was Rep. Kim Schrier (D., Wash.), who replaced the POW flag she had displayed outside her office with a transgender pride flag. The first picture is of the outside of Schrier's office from a January Facebook post, while the second is from earlier this week. The name plates appear different because Schrier, who is a doctor, later had "M.D." added after her name. Schrier's office told the Washington Free Beacon that the POWMIA flag has not been removed permanently. "We were asked to fly the Transgender Equality flag by the National Center for Transgender Equality this week ahead of Transgender Visibility Day on Sunday," a spokesperson for the office said. "Our POWMIA flag has been in the Congresswoman's office this week. And will be back outside our office tomorrow." Staffers from the office of Rep. Pete Aguilar (D., Calif.) were spotted attempting to pull their office's POW flag out of its stand on Wednesday. A source told the Washington Free Beacon that Aguilar's office initially tried to remove the POW flag, was unsuccessful, then managed to remove it soon after. The picture below shows the pink, white, and blue transgender flag on the right side of the door of Aguilar's office. 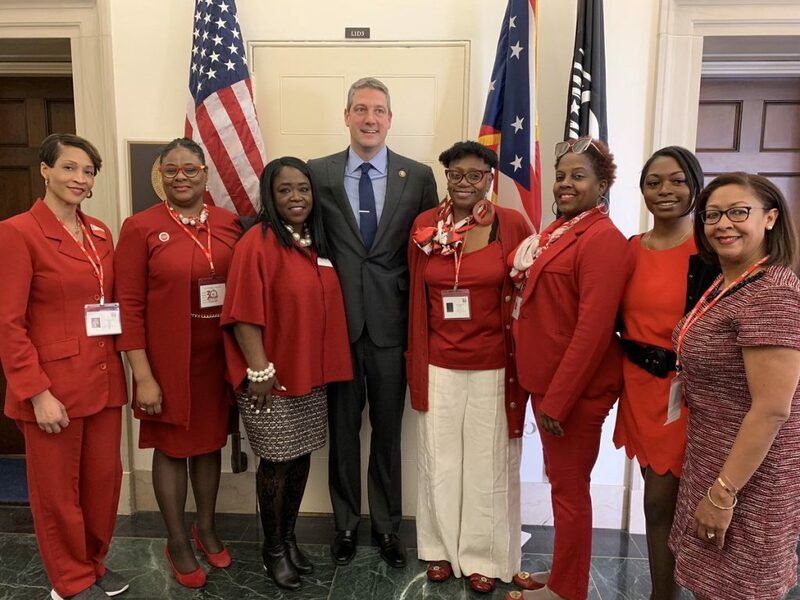 Rep. Tim Ryan (D., Ohio) also replaced the POW flag with the transgender flag. The first picture is from a March 12 tweet, while the second is from a March 27 tweet. In the first photo, the POW flag is to the right of the Ohio state flag, while in the second photo, the transgender flag has taken its place. The offices for Aguilar and Ryan did not respond to requests for comment. Several other offices have hung transgender pride flags outside of their offices this week in advance of International Transgender Day of Visibility on Sunday, The Hill reports. House Speaker Nancy Pelosi (D., Calif.), Rep. Alexandria Ocasio-Cortez (D., N.Y.), and Rep. Jennifer Wexton (D., Va.) are among the other members of Congress who also placed the flags outside their offices. A Republican office on the Hill reached out to the Washington Free Beacon to say it was also asked to replace their POW flag with the transgender pride flag. The change was not made. 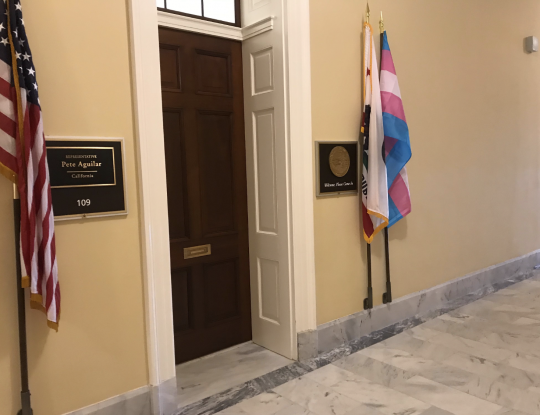 2/ With the help of community members & volunteers, we delivered trans pride flags to EVERY member of the Congress, from every party, including voting members and non-voting delegates. Not all Democrats who put up the transgender pride flag removed the POW flag. Rep. Adam Smith (D., Wash.), for example, placed the transgender pride flag and POW flag next to each other. Likewise, Rep. Ann Kirkpatrick (D., Ariz.) also hung up the transgender pride flag on her door and chose to leave the POW flag displayed. Update 1:54 p.m.: This post has been updated to reflect comment from Rep. Schrier's office. This entry was posted in Politics and tagged Congress, House Democrats, Transgenderism. Bookmark the permalink.